Only the ugliest, most wasteful parking craters are still in the running, as the Parking Madness Final Four winnows down to two finalists after this match. The winner will take on Camden, which narrowly defeated Fort Worth, for a chance at the Golden Crater, eternal shame, and, we hope, some good awareness-raising opportunities for local advocates. 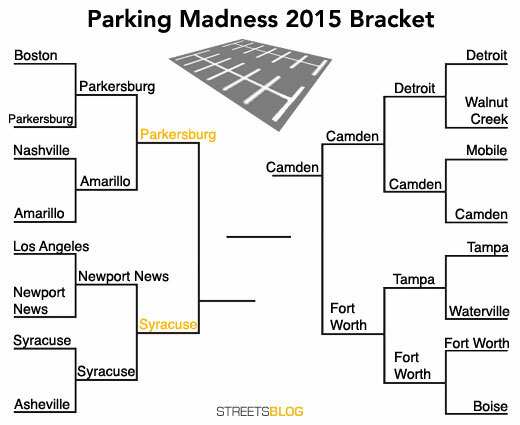 So far your voting has brought Syracuse head-to-head against Parkersburg, West Virginia. Who gets to advance to the championship match? I went to school for Landscape Architecture at SUNY-ESF in Syracuse and so I know the city quite well. This image is of downtown Syracuse just south of the I-690/I-81 interchange. This elevated highway goes through the heart of the city, and since its inception the land immediately adjacent to the highway has suffered the consequences of low property values for 50 plus years. Additionally, Syracuse’s economy is well past it’s prime. These two things have combined to create this horrific parking crater in the heart of New York State’s Central City. Hopefully this award will bring further attention to the surplus parking problem in downtown Syracuse. Let’s see how it measures up against the competition. Here is my submission for the Golden Crater, aptly named “Park”ersburg, WV. With a population around 31,000, it is the fourth-largest city in West Virginia and my hometown. This town has seen Native American raids on settlers (and vice versa), George Washington surveying, planned treason by Vice President Aaron Burr (check out the history of Blennerhassett Island), Civil War soldiers, some of the first governors of WV, Wright Brothers flights, birth of the country’s oil and gas industry, important transportation hubs, large-scale hardware and chemical manufacturing, and countless historical events. Those which took place downtown are likely under asphalt (like the home of the first governor of our state). By my calculations, including street and sidewalk ROWs, the total amount of land in downtown Parkersburg is approximately 61% paved. Of the developable land in this same area (not counting streets), about 50% is dedicated surface parking, most of which is monthly rentals. Yup, the only short term parking is on-street, in one garage, or in a newly-built parking lot off of 6th St. They dedicate half their land to surface parking. Ugh. The area in question, besides the entire downtown area, is that from 4th Street to the Little Kanawha River. Much of this is dominated by City, County, and Federal government services and includes the County Courthouse (beautiful Romanesque revival) and the Municipal Building (no so beautiful). From the Google Maps link, it shows some buildings currently demolished; the entire block between Juliana/Market/1st/2nd is paved, as will the building across Market Street abutting 2nd St (the old jail). And to make matters more depressing, the area is bounded by elevated railroad tracks near Ann St., an at-grade railway, and a concrete floodwall. Which one deserves a shot at the title? Tell us below. Definitely a tough one. Once again, I wanted to declare a tie. For next year they should have a big city/small city divide. Like >100k and <100k or something. I feel like trashing Parkersburg is kinda like picking on a dying rust belt county seat. 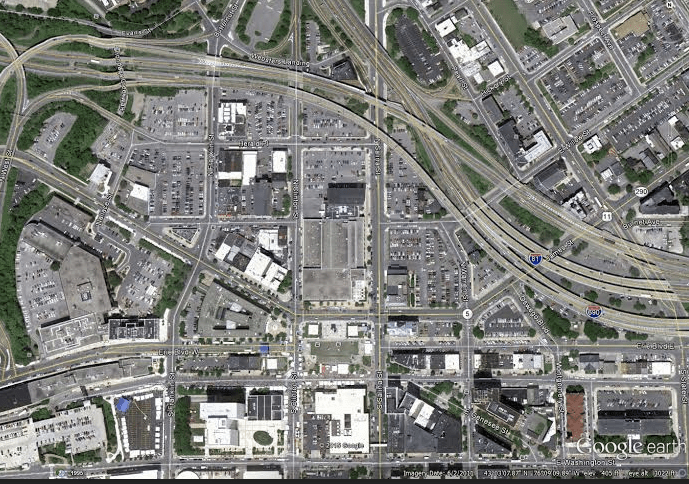 I'm not trying to belittle the city but how do you compare that to a parking crater in Boston or Fort Worth? Less urban renewal than you would think. 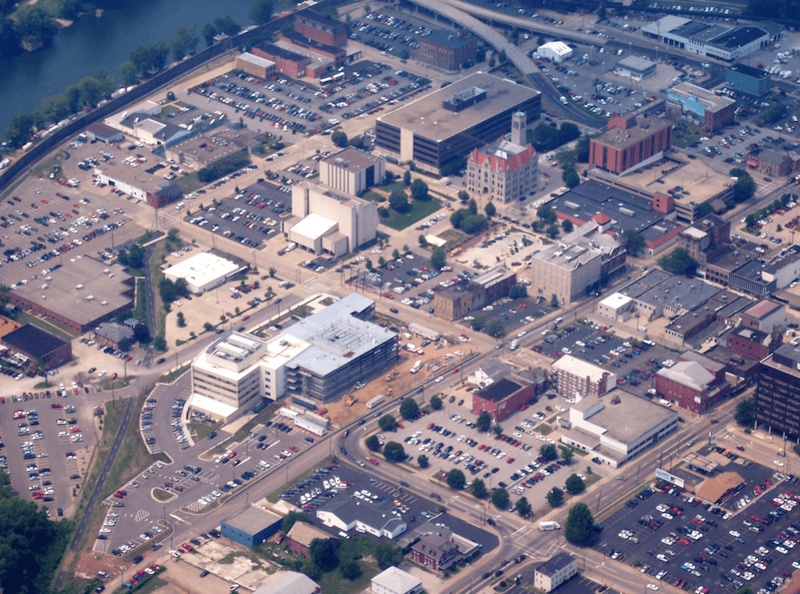 The area in the picture above is the only part of Parkersburg that had any formal renewal project. There was a project in 1971 to tear down the courthouse square and build the glass and steel building next to the courthouse as seen in the top center of the pic. Everything else is just rust belt or replacements of individual buildings. It did. In the 70s, someone came in and tore down most of our beautiful historic buildings and put in parking lots. The locals call it Parkinglotburg instead of Parkersburg. No, Charles, what about the loss of our beautiful city building? It may not have been named “urban renewal” but there really was no other excuse for it except the mayor was part owner of a construction company. From Parkersburg, live in Newport News. Maybe I’m to blame? Parkersburg (which my husband and I call Parkingburg) should definitely win this title. We live there and everything said in the description is true…there is a lot of surface parking but most of it IS monthly rental spaces. There are two parking garages and one is so little used that they have flea markets in it on the weekends. Other than for legal/business reasons, there’s little to go downtown for because there is no retail activity to speak of. There are lots of attorney offices, banks, churches, and so on…but only two restaurants, a cafe, a sandwich shop and one coffee shop. I believe there is one retail store called “This and That” which is a combination of a convenience store and pawn shop, but that’s the only retail I can think of in the downtown area. Holy crap. Parkersburg. I was a speaker at an event at the municipal building last year. I was almost late because I had to park like four blocks away. Downtown is a maze of one way streets, employee only parking, and handicap parking. It seems like if you are an average citizen trying to visit a government building in Pburg, you need to park in the next county!